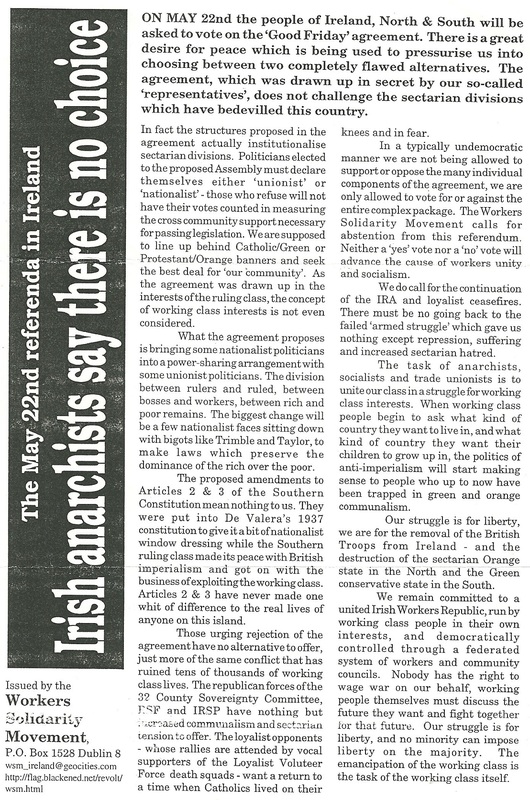 From the 1998 Good Friday Agreement Referendum a leaflet from The Workers Solidarity Movement calling for voters to abstain in the Referendum. A selection of stickers produced by The WSM around 2000 . 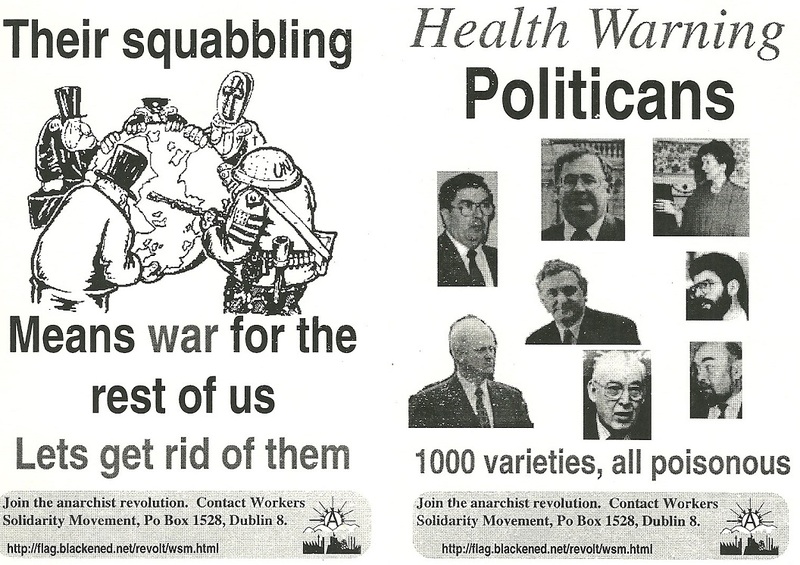 An “Anarchism” explanatory leaflet from The Workers Solidarity Movement from around 1986. 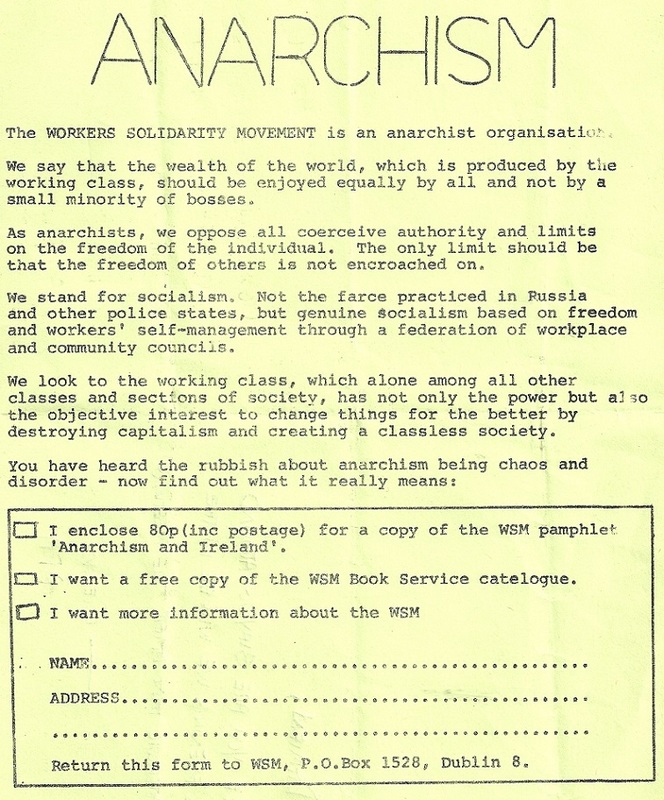 The leaflet advertises the WSM Pamphlet “Anarchism and Ireland” which is available in pdf form here at the Irish Anarchist History site. 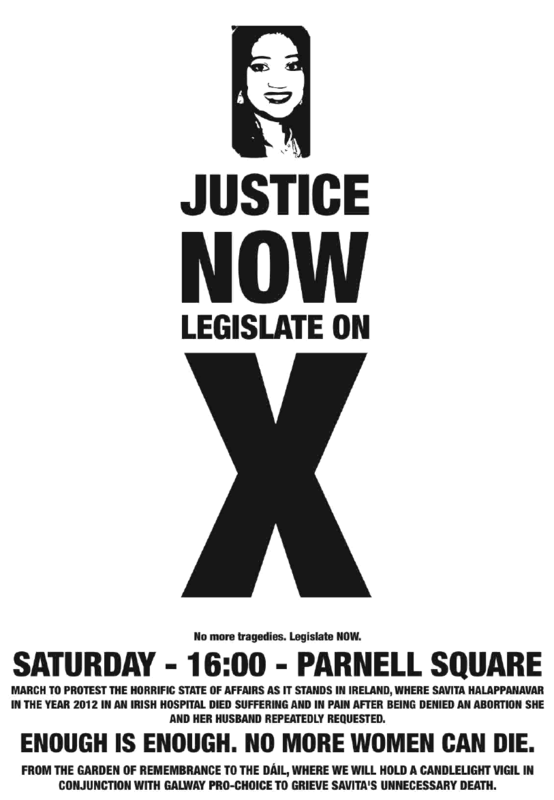 Following the tragic death of Savita Halappanavar, A “Justice Now Legislate on X” Leaflet for a protest Saturday 17th November at 16.00 Parnell Square. 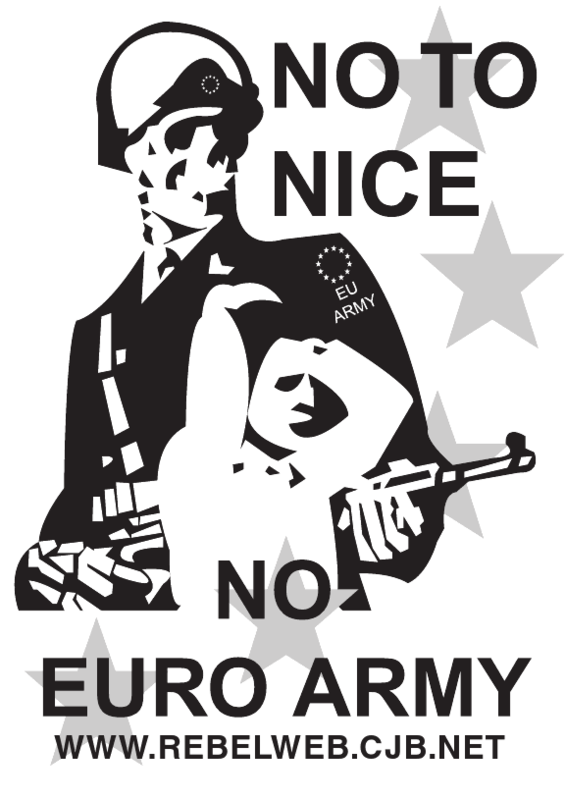 A “No To Nice – No Euro Army” poster from the Nice Trety Referendum Campaign produced by a part of the Irish Anarchist movement. 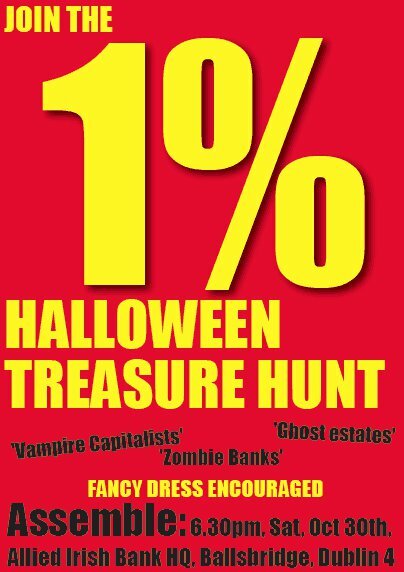 On October 30 the 1% Network will be holding a Halloween event amongst the most expensive streets of Dublin where mansions have sold for up to 51 million. We will be meeting at 6.30 in the evening near the RDS (exact venue to be announced). We will be having a look at some of the monsters who think the costs of the crisis should be paid for by the low paid, the sick and the unemployed rather than the 1% who own 34% of the wealth in the country. Come along and join us, fancy dress along the theme of zombie developers, vampire bankers and ghost estates encouraged. 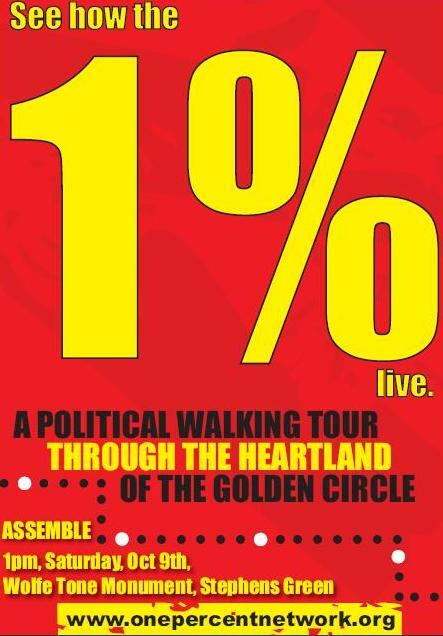 A Poster/Leaflet advertising a political walking tour through Dublin 2 and Dublin 4 on Saturday 9th October. The event is organised by the 1% Network. From the 1% Network Website..
What is the 1% Network? The 1% network is a coalition of socialist groups which has come together to oppose the cutback agenda of the government and to promote a socialist alternative to the current socio-economic system. Organisations within the 1% Network include éirígí, Irish Socialist Network, Seomra Spraoi and the Workers Solidarity Movement. Many of these groups took part in the ‘Anti-Capitalist Block’ demonstrations in Dublin City Centre in May of 2010.